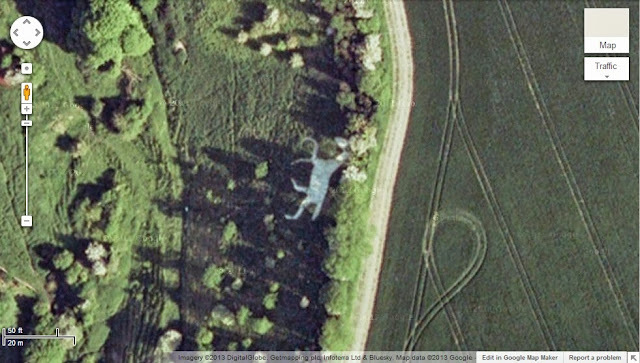 Living in Wiltshire, I regularly find myself driving past white horses that have been etched into the countryside. A number of these white horses I have seen numerous times, but really I know nothing about them. 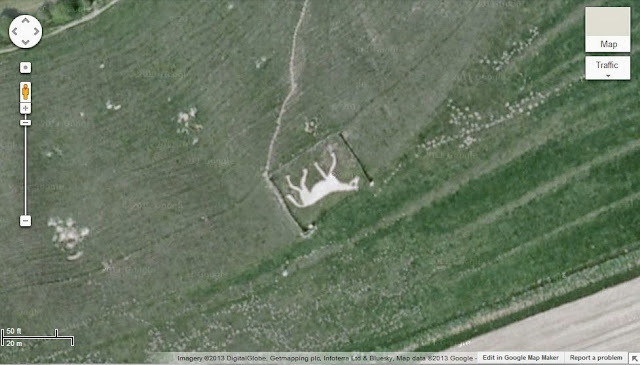 So I recently had the idea to get in the car and do a tour of the local Wiltshire white horses, and as a preview I decided to explore them via Google Maps. 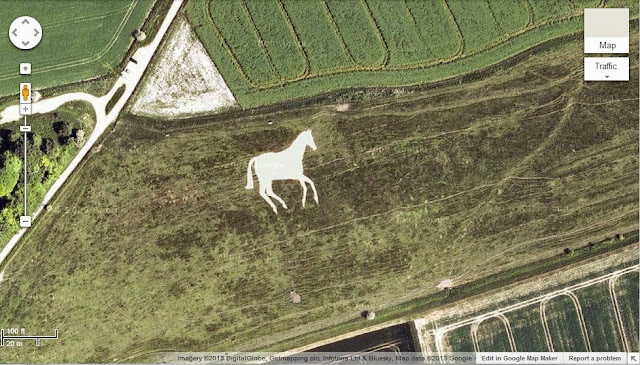 Here is a roundup of the white horses that I found via Google Maps. The white horses are listed by estimated age, with the oldest first. 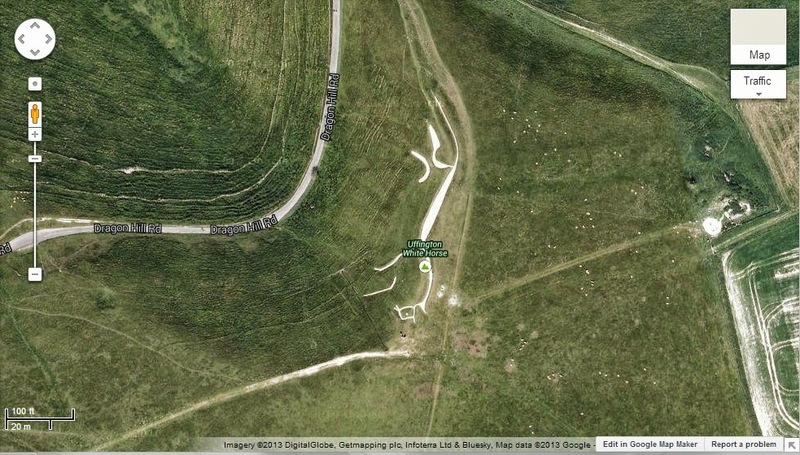 The Uffington White Horse can be found on the slopes of White Horse Hill, which is south of the village of Uffington (south of the B4507). The white horse is around 110m in length and is believed to date from the late Bronze Age (1000–700 BC) / early Iron Age (800 BC–AD 100), which makes it the oldest white horse in Britain. 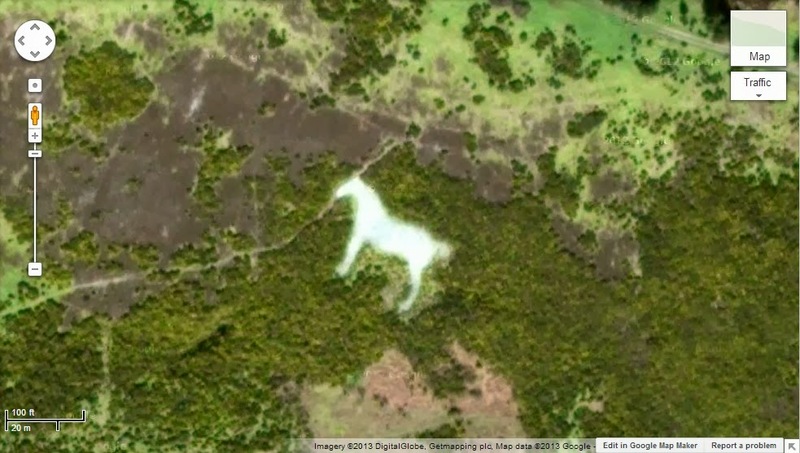 The other interesting aspect of the white horse is its unusual design, which is seemingly unique amongst the other white horses that have been created. This highly stylized representation of a horse has led to some debate as to whether the animal that is represented is supposed to be a horse or not, but the figure has been referred to as a horse since around the 1100’s. The Westbury White Horse lives about 1.6 miles east of the town of Westbury in Wiltshire (south of the B3098), and is just below an Iron Age hill fort (Bratton Camp) on the edge of Bratton Downs. The Westbury White Horse is believed to be the oldest of the white horses in Wiltshire, however it seems that there is no firm evidence (documentary or otherwise) for the existence of a chalk horse at Westbury before the year 1742. Legend suggests that it was carved to commemorate King Alfred’s victory at the Battle of Edington in 878 (see my previous blog post on “King Alfred’s Folly”). King Alfred was supposedly born in the Vale of White Horses near Uffington and archaeological evidence suggests that the Uffington White Horse would have been long in existence before King Alfred’s birth, and as such it could have provided inspiration for the Westbury horse. The Cherhill White Horse can be found just to the southeast of the village of Cherhill (to the south of the A4); the horse lies on the side of a hill fort known as Oldbury Castle. 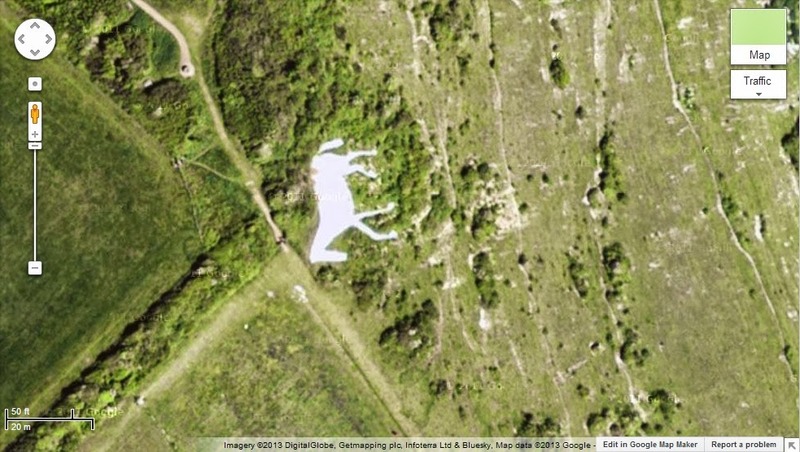 The Cherhill White Horse is believed to be the third oldest white horse in Britain, and was cut in 1780 by a man from nearby Calne. Apparently the horse once had a unique feature, a glass eye, which was created by bottles being pressed upside down into the ground. It seems that this glass eye would reflect sunlight enabling the horse's eye to be seen from quite a distance. The eye however, is no longer made of glass. 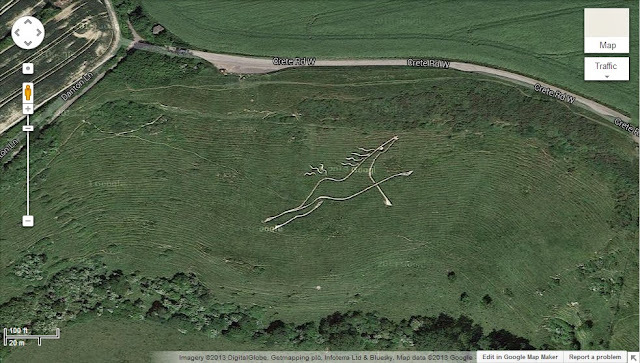 The Strichen White Horse can be found a few miles northeast of the village of Strichen, cut into Mormond Hill. 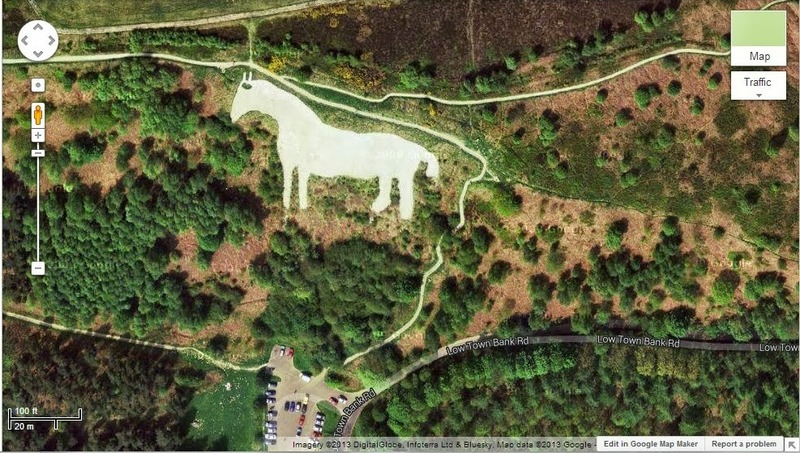 The horse is believed to have been cut around 1800 and the figure is not (like most white horses) filled with chalk but is instead filled with local white quartz. The Preshute White Horse lives southwest of the town of Marlborough, just to the west of the A345 on Granham Hill. The horse is believed to have been cut in 1804, by the pupils of a local school. 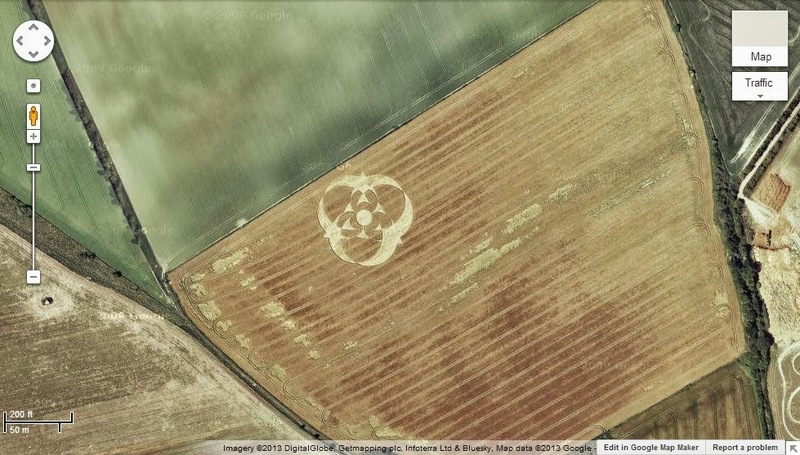 Whilst searching for this horse on Google Maps I also happened across a crop circle to the west of Marlborough. 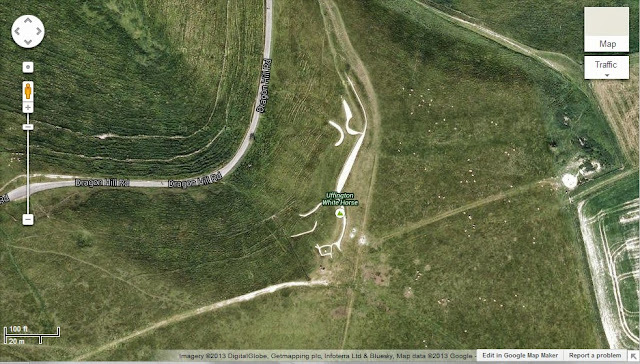 The Osmington White Horse is a couple of miles to the northwest of the village of Osmington. The horse is distinctive as it is one of the few white horses that faces to the right and it is the only horse to be depicted with a rider. The horse was cut in 1808 and the rider represents King George III, who regularly visited the nearby resort of Weymouth. This horse is measured at 85m long by 98m high. The Alton Barnes White Horse can be found about a mile directly north of the village of Alton Barnes in Wiltshire, etched into the side of Milk Hill. The horse was cut in 1812 and was apparently based on the Cherhill White Horse which is also in Wiltshire. From the top of Milk Hill another nearby white horse (at Pewsey) can also be seen. The Board Hinton White Horse (also known as the Hackpen White Horse) lies about two miles southeast of the village of Broad Hinton (on the side of the B4041). Details of the origin of this white horse are not certain, but some believe it was cut into the hillside in the mid 1800’s (possibly in 1838 to commemorate the coronation of Queen Victoria). 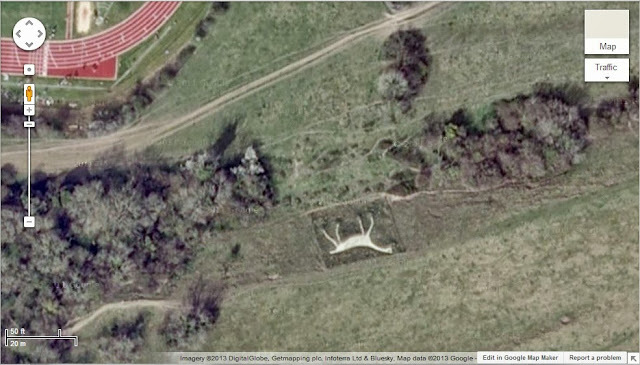 The Kilburn White Horse can be found to the north of the village of Kilburn, on the western side of Low Town Bank Road. This horse dates from 1857 and is around 97m long by 67m high, covering around 1.6 acres, making it one of the largest white horses in Britain. The Broad Town White Horse is situated about half a mile northeast of Broad Town in Wiltshire. 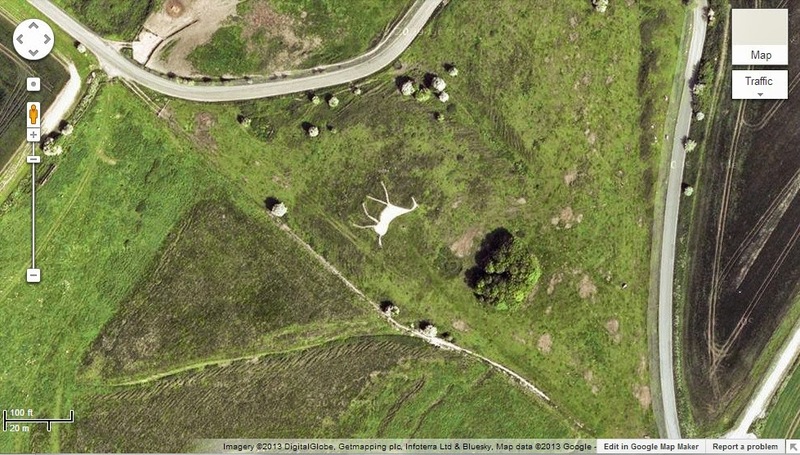 This white horse is believed to date from 1864 and was cut by the farmer who owned the land at the time. The Litlington White Horse is situated southwest of the village of Litlington, on the opposite side of the Cuckere River to the village. The present horse was cut around 1924 and is apparently close to the site of an earlier horse that was cut around 1838 (possibly to mark the coronation of Queen Victoria). The Pewsey White Horse is located about a mile south of the village of Pewsey on the side of Pewsey Hill (to the northeast of the Everleigh road). The horse was cut in 1937 to commemorate the Coronation of George VI and is very close to the site of a much older Pewsey White Horse. The original Pewsey White Horse was believed to have been cut around 1785 by a man from Alton Barnes, possibly the same man who cut the Alton Barnes horse in 1812. The Devizes White Horse can be found a couple of miles northeast of Devizes (almost directly north of Northfields on the A361). 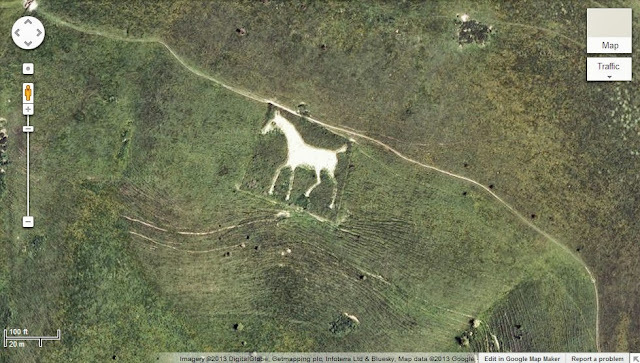 This white horse is the most modern of the Wiltshire white horses, and was cut in 1999 to mark the millennium. The Devizes horse is rare in so much that it is only one of the few that face to the right, the majority of white horses face to the left. This white horse is not the first that has resided in Devizes. 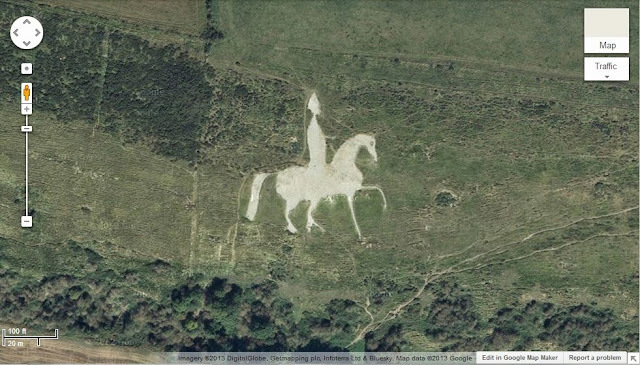 A white horse was originally cut in 1845 just below the nearby hill fort (known as Olivers Castle), which is about a mile to the west of the current white horse. This original white horse was apparently known as the "Snob's Horse". Due to a lack of maintenance this original horse disappeared over the decades. 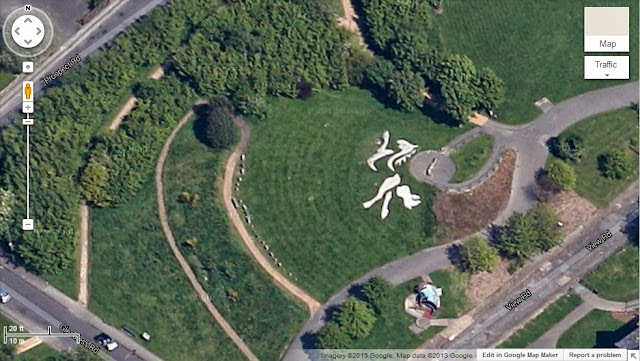 This white horse can be found in the center of Sheffield in the Heeley Millennium Park. The horse was created in 2000 and is said to commemorate a local horse which died at a nearby farm in a fire in 1995. The Folkestone White Horse lives to the north of Folkestone, just below Crete Road (West). The horse was intended to mark the millennium, but it was constructed belatedly between 2002 and 2003. The white horse is unique amongst the other white horses as it is an outline figure (as opposed to a solid figure) and it is constructed from limestone slabs, which have been pinned together and secured to the ground. While not actually a white horse, this welsh earth work is a stunning sight. The 200m long sculpture represents a welsh pit pony and was created in the late 1990s. Some horseshoe imprints have been cut into the ground around the pony which help to make the pony very easy to spot from above. 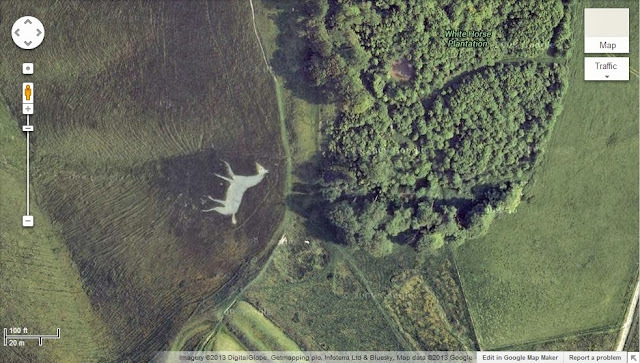 So that is the end of my virtual tour of Britain’s white horses. Because I did not know much about the white horses before I started looking I have found two things rather interesting. Firstly I assumed that white horses would be fairly evenly distributed across Britain. It is clear however that Wiltshire is currently the main home for white horses. 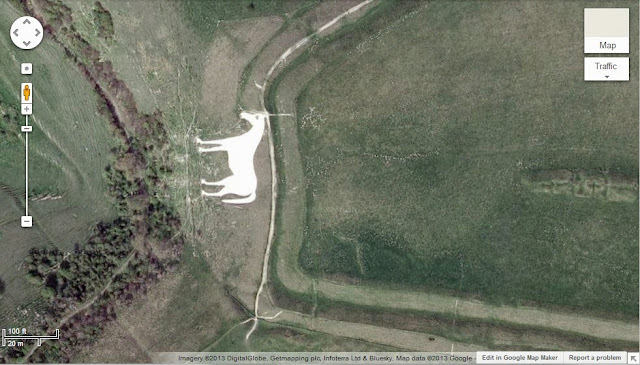 Presumably a chalk hill is an ideal prerequisite for carving a white horse, so perhaps Wiltshire's geology favors it being a home for white horses? The other thing that surprised me was how modern the white horses are. Most of the white horses seem to date from after 1800, and without knowing better I would have assumed that they would have been much older. 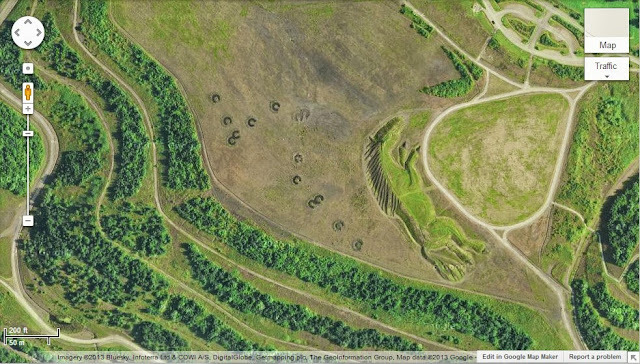 In my next blog post I will finish this virtual tour of chalk earthworks by looking at some of the other (non-horsey) earthworks that can be found around the country (again predominately in Wiltshire). I enjoyed the armchair tour Paul, thanks for sharing. regards Kath in Somerset.